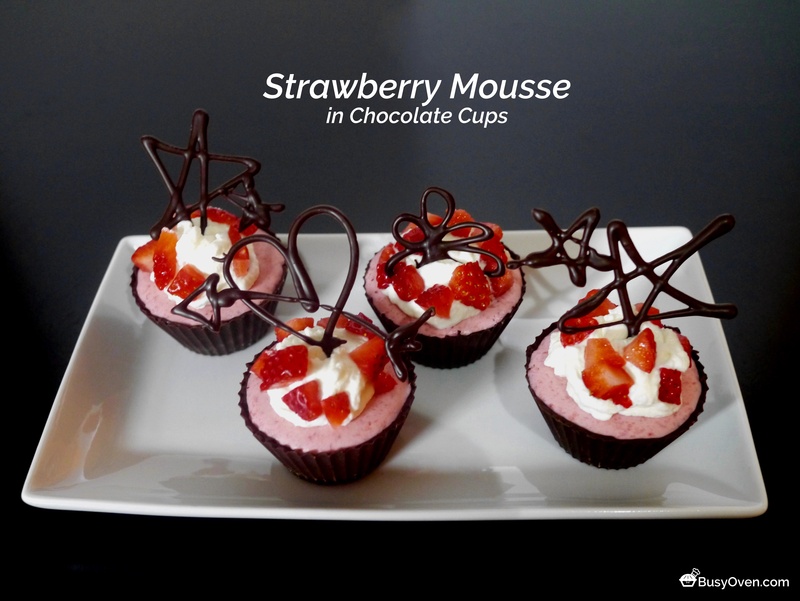 Chocolate dipped strawberries are plentiful this time of year so I decided to mix things up just a little bit and make Strawberry Mousse in Chocolate Cups. This strawberry mousse is nice and light, and pairs very well with bittersweet chocolate (and a little bit of lemon whipped cream on top). The mousse itself doesn’t require a lot of ingredients. This recipe includes cream cheese (rather than white chocolate) to give the strawberry mousse a nice thickness and does so without overpowering the strawberry flavor. The first step is preparing the strawberries by hulling all of them and chopping a handful of them into small bits for garnishing. The rest of the strawberries go into a food processor and get blitzed for only a few pulses before getting their juices drained. Some of the strawberry juice gets reserved and added to some gelatin. The rest of the juice gets reduced down to about 3 tablespoons. This step will make your house smell incredibly good. The gelatin and cream cheese are added to the reduced strawberry juice off heat, and stirred until the mixture is smooth. The strawberry chunks that were strained before go back into the food processor and get blitzed down into a puree. The puree will then get added to the reduced strawberry/gelatin/cream cheese mixture. The final addition is a little bit of whipped cream. The whipped cream gets folded gently into the strawberry mixture. I prepared chocolate cups using bittersweet chocolate. Fill the cups with mousse, and refrigerate them until they’re ready to be served. That’s where some lemon whipped cream and the strawberry garnishing came in handy! The lemon whipped cream really added a nice contrast to the dark chocolate flavor, and the chopped strawberries enhanced the strawberry flavors in the mousse. There was a bit of chocolate left over after making the chocolate cups, so I made some decorations. Cut enough strawberries into 1/4-inch dice to measure 1 cup; refrigerate until ready to garnish. Pulse remaining strawberries in food processor in 2 batches until most pieces are 1/4 to 1/2 inch thick (some larger pieces are fine), 6 to 10 pulses. Transfer strawberries to bowl and toss with 1/4 cup sugar and salt. (Do not clean processor.) Cover bowl and let strawberries stand for 45 minutes, stirring occasionally. Strain processed strawberries through fine-mesh strainer into bowl (you should have about 2/3 cup juice). Measure out 3 tablespoons juice into small bowl, sprinkle gelatin over juice, and let sit until gelatin softens, about 5 minutes. Place remaining juice in small saucepan and cook over medium-high heat until reduced to 3 tablespoons, about 10 minutes. Remove pan from heat, add softened gelatin mixture, and stir until gelatin has dissolved. Add cream cheese and whisk until smooth. Transfer mixture to large bowl. While juice is reducing, return strawberries to now-empty processor and process until smooth, 15 to 20 seconds. Strain puree through fine-mesh strainer into medium bowl, pressing on solids to remove seeds and pulp (you should have about 1 2/3 cups puree). Discard any solids in strainer. Add strawberry puree to juice-gelatin mixture and whisk until incorporated. Using stand mixer fitted with whisk, whip cream on medium-low speed until foamy, about 1 minute. Increase speed to high and whip until soft peaks form, 1 to 3 minutes. Gradually add remaining 1/4 cup sugar and whip until stiff peaks form, 1 to 2 minutes. Whisk whipped cream into strawberry mixture until no white streaks remain. Portion into dessert dishes and chill for at least 4 hours or up to 48 hours. (If chilled longer than 6 hours, let mousse sit at room temperature for 15 minutes before serving.) Serve, garnishing with reserved diced strawberries. Melt 3/4 of the chocolate (12 oz) in a double boiler or on a bain-marie to 118 degrees F (48 degrees C) for Dark Chocolate (or 112 degrees F (45 degrees C) for Milk Chocolate if you choose to work with milk chocolate). Remove the bowl from the simmering water when the chocolate reaches 118 degrees F and add the remaining 4 oz of chocolate. Continue to stir the chocolate until it cools down to 81 degrees F (27 degrees C). Finally, put the bowl of chocolate on the simmering water once again and heat until it reaches between 88 – 90 degrees F (31-32 degrees C). Work quickly to brush the chocolate into either silicone cupcake cups or paper cupcake liners that have been lightly oiled. Refrigerate the chocolate cups for 5-10 minutes and brush on a second coat. Place in the refrigerator again until ready to fill. Fresh Strawberry Mousse recipe from America’s Test Kitchen.